GOSPELflava.com: You have been a respected crooner in the R&B world for some time now. Why did you decide to do Gospel? Dave Hollister: You know what? It was just time. I was at a concert with Tank and the promoter did not pay us, and I did not have anything to show my family why I had not been home. I just got down on my knees and realized that I needed to do the will of God. It was just time. GOSPELflava.com: There have been folks in the past that have claimed that they were singing Gospel now, then after a time, they go right back to mainstream music. Do you think people will have a hard time believing your commitment, and what would you say to them? Dave Hollister: I am not really caring what other people are thinking about me. God knows my heart and God called me to do this, not people. I keep my covenant with God. I still want to give the people me, and not try to be anyone else. Kirk Franklin is Kirk Franklin. Byron Cage is Byron Cage. Fred Hammond is Fred Hammond. I felt if I did anything besides my style, then that I wouldn't be true to who I am. GOSPELflava.com: You are honest and candid on this album, taking us through your trials and describing your new journey with Christ. The banger "Help Me" was produced by Warren Campbell and Eric Dawkins. Can you tell us about that song? Dave Hollister: God has called me to be real. Even in R&B I was always real and you could always tell where I was in my life from my music. I just felt like I had to be the same way in Gospel. Who said that Christians don't have struggles? I wanted to talk about what most Christians won't talk about and what they sometimes hide from. When you get saved, everything is not easy, and you still have some issues. One of my struggles is drinking, and that was a BIG struggle for me. It was a question like I stated in the song, "What's wrong with going to clubs on the weekend? What if I want to sleep in on a church day? If I drink once a week? Is that the way it is or is it just me?" I know a lot of preachers, pastors and bishops that drink. Some of them drink wine and some drink vodka. It's like, what's the problem? I am saying "Lord help me. I'm just trying to understand?" GOSPELflava.com: You did a traditional song, "The Potter" that is blessing many. Why did you pick that particular piece to remake? Dave Hollister: I was a huge O'Neal Twins fan, and Shep Crawford asked about some of the artists that I like. He said, "That's crazy because I have a remake of one of their songs, but I will let you hear it when you get here." When I got there, I was like "Wow", because it was my favorite O'Neal Twins song. It was so crazy man. Shep is a great producer. When I was in R&B, I use to tell people that he was underrated. I'm just blessed to work with him. GOSPELflava.com: There was always talk that Dave Hollister should be singing Gospel music, and people might have known that was coming. Now you are preaching. Dave Hollister: You know what Dwayne, it's very, very funny. It's an honor that God would call me to do something like this. To be in this place, finally, I am still in awe and it's been two and a half years now. GOSPELflava.com: Obviously, your transition is affecting and blessing many. Are there any mainstream artists that have been positively affected by this transition of yours? Dave Hollister: There are a lot of artists and peers of mine that are affected by it. I don't know if I can mention any names, but there are many that have seen the transition and seen the change in me. When I hit the stage and the anointing of God flows, then it's like "Wow, this dude is for real." One well-known comedian and were both at a show he is still in the secular arena, but he was hosting this Gospel show where the Holy Spirit was moving and the atmosphere was filled with worship. I looked over at him, and I saw him with his hands up and crying. When he came back to the stage, he was like "Wow. Amazing. Dave Hollister." He wanted to just stay in the attitude of worship. He is well known, and he is very funny. I can tell you one person that I am talking to. That's R Kelly. I have been ministering to him. People are seeing that the life that I used to live is not the same, and they are seeing the change. They are seeing God move in my life. I just want God to be glorified in every area of my life. GOSPELflava.com: Where is God is leading you? 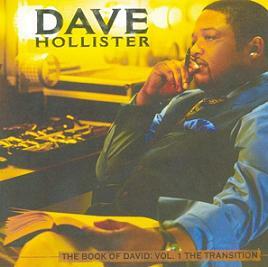 Dave Hollister: He's just leading me to be open and hear His voice. It's crazy that you are asking this question because I am just coming off of a four day fast. God is revealing to me that He does not want me to see where I am going. He does not want me to see what the plan is. He wants me to be totally dependent on Him, and to hear his voice so that He can tell me where to go. If I learn where He wants me to go, then I would put my own hand in it, and mess it up. He wants me to be totally focused on hearing His voice and following His instruction. I have committed to a life of fasting and praying. Anyone that has listened to Dave Hollister knows that he has a tremendous singing voice. Now, he has not only made a transition to Gospel music, but he has changed his lifestyle. Keep Dave Hollister lifted before God in prayer. Let's watch his career as it goes to higher heights.